Unit 8, 3 South Street, Canning Vale, WA 6155. We are conveniently located on the corner of South St & Bannister Rd (opposite Market City). Please see map below to familiarise yourself with our location before your first visit. If coming down South St from Fremantle, turn left into the carpark just after you pass Roe Hwy (entry #1). 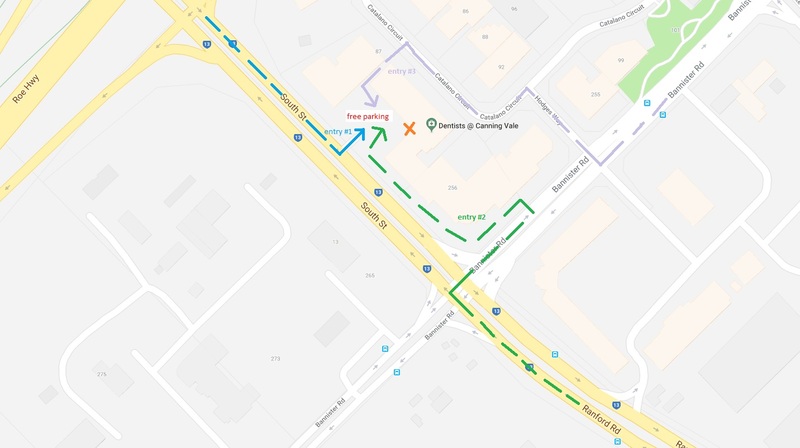 If coming down Ranford Rd from Canning Vale, turn right onto Bannister Rd, and immediately enter the carpark on your left and drive all the way around Westpac Bank and locate us between Inspirations Paint and Giant Bicycles (entry #2). If coming from Bannister Rd, turn right onto Hodges Way. Then turn left onto Catalano Cct. Turn left at Ultra Tune into the shops (entry #3).